I was reminded of my younger self while reading Manjula Martin’s new anthology, Scratch: Writers, Money, and the Art of Making a Living. It is a collection of essays made by and for writers that bluntly uncovers the many different avenues that make up the #writerslife struggle. It is filled with detailed information and personal anecdotes which show that no one writer is to share the same journey. With support from critically acclaimed authors like Roxane Gay, Cheryl Strayed, Kiese Laymon, Daniel Jose Older and more, it reads like a writers self-care retreat. When I was in the fifth grade I entered into my first writing competition, sponsored by Tropicana. I wrote a fictional story about a little girl who was walking home from school but found herself in a warrior-like fight with a group of boys who tried to kidnap her. It was bloody and gruesome, but my main character was the one who came out victorious. The story was inspired by a time when I was forced to walk home from school because my uncle forgot to pick me up. The memory of that day, waiting outside for the ride which would never come, is vivid and still feels like yesterday. I remember feeling angry when the front of the schoolyard was empty. If I would have known I was going to have to walk, I would have walked with the crowd who takes the same route, I remember thinking. My nine-year-old self didn’t think to go inside to phone my parents. Instead, with a bumping in my chest, I started the walk home. Today, I am no longer nine-years-old and winning writing competitions do not emerge so easily, but I am still with an urgency towards the craft. I was scared. The world felt massive and I too small for it. I eyed every person who passed by, wondering if I’d have to kick and scream at any given moment. I made a right onto a street that was deemed a shortcut, wanting to get away from the exhaustion of watching people closely. The shortcut had less people walking around than the main road and the houses were pretty, large and decorated with green summer lawns. I felt comfortable in this solitude. Suddenly, I felt a pain in my foot, as if I was being poked, but I was too afraid to stop walking. I slowed my walking to a limp, attempting to avoid the poking when I noticed a group of boys ahead. They were teenagers, much larger than me, and I could tell they were boys by the movement in their walk. Their shoulders swayed as they moved, they wore hats and had on jeans that didn’t fit tight against their skin. My heart started to beat loudly, the poking in my foot suddenly felt unbearable. I had to do something quickly before they got too close. I was scared. The world felt massive and I too small for it. I casually walked into the pathway of a red and white home and sat on its porch. It didn’t matter to me who lived there. Using the house as a safety net, I wanted to provide the illusion that I had arrived at home and there were people inside who cared for me. Attached to the bottom of my shoe was a nail, I struggled to remove it. The boys, minding their own business, were talking and joking with each other as boys do. They passed me while I was sitting on the porch, without noticing I was even there. I, however, watched them very closely until they were far enough away. Then I got up and nearly ran the last three blocks home. My big sister opened the door for me, home sick, and she looked out into the street and asked, “Where’s Uncle Ben?” When I told her no one ever came to pick me up, she immediately called our father who hung up the phone to call his brother. On the day the winner for the writing competition was announced, I sat in the auditorium with my peers while my mother sat in the section for parents. They announced the third place winner and then the second place. I looked back at my mother, who was smiling and clapping, her nod urged me to get up from my seat to accept what was mine. I wish I had a copy of that story and could remember what I was thinking on my walk through the aisle, to accept the gold medal that would wrap around my neck. Was I proud? I stood in line next to the other winners while the host spoke about the importance of storytelling, reading and, of course, writing. That was the day I knew I was to be a writer. Today, I am no longer nine-years-old and winning writing competitions do not emerge so easily, but I still possess an urgency toward the craft. The problem I confront nowadays, as with many writers, remains with locating publications that believe in my voice enough to pay for it. In pursuit of a space to create, I am constantly asking others “What else can I do to be a well-known writer?” and the answer is always the same, “Write.” What Scratch does for its reader is more than provide a one-word answer but, rather, allow the reader (who is also a writer) to feel human and valid in the fluctuating brawl that feels relentless. Martin is a successful writer herself, but she didn’t come out of the womb that way. She, too, had to undergo rejection and confusion. The collection is a representation of her earlier years, from a time when she wish she knew someone from the industry who’d keep it real. She founded and edited Scratch magazine from 2013 to 2015 which provided information about writing and money. In 2012, she created the blog Who Pays Writers?, a list of details with freelance writing rates from prominent publications—and whether these outlets follow through with their scheduled payments. Her words have appeared in places like Virginia Quarterly Review, Aeon Magazine and more. It appears as if Martin has dedicated her life to accumulating information for her comrades who share the same passion as she, who have deemed themselves married to writing but do not obtain the resources to immediately build a ship that will shoot to the stars. Oh, how we need thee! Scratch reveals secrets that one will not know without inside connections to the gatekeepers. 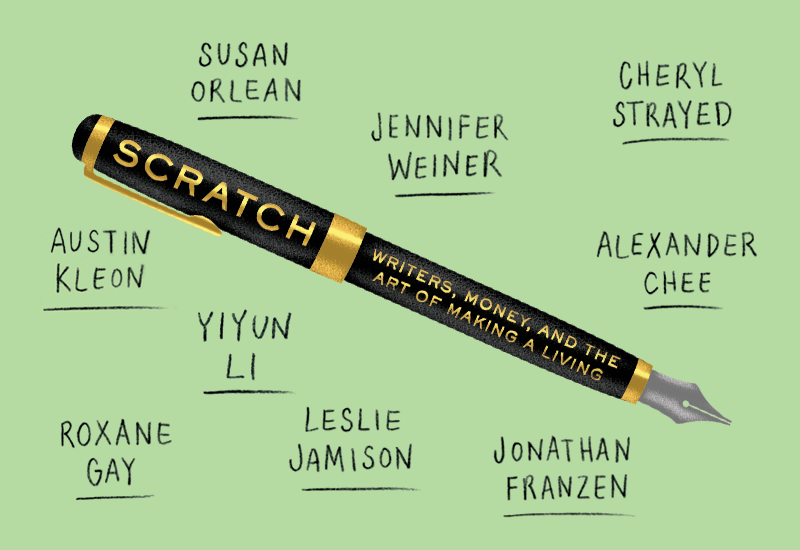 Scratch is a bible, in the sense that it is filled with rituals on different ways to survive, to find the light, to strive and to be the best version of oneself; while, also, striving to remain happy.